Nominated for four Academy Awards, but winning none, Todd Haynes' Far From Heaven was certainly not admitted to Oscar paradise. But that's because it's too good for those "discriminating" Oscar voters. PHILIP CHEAH tries to get close to God. Todd Haynes loves genre. But what he loves more is subverting them. That can be seen as far back as his debut feature, Poison (1991) and even in his short featurette, Superstar, the life of Karen Carpenter told through puppet animation. As one of the bright lights of the new queer cinema, Haynes has been clear about his cause, and there is no clearer film than Far From Heaven, a tale of a marriage which crumbles when the husband, played by the macho Dennis Quaid, admits to his gay feelings. But the film transcends even that by detailing larger issues of discrimination against race, women and even children. Haynes does this brilliantly by exploding the 50s melodrama conventions as auteured by the master, Douglas Sirk. He realises all the gay themes repressed in those movies. In short, Far From Heaven shows Quaid doing a Rock Hudson that Hudson (who was gay) himself couldn't do in Sirk's classic, All That Heaven Allows (1955). 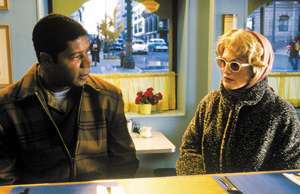 In Far From Heaven, Quaid's wife (Julianne Moore) deals with her husband's gay confession by falling in love with another discriminated group, her black gardener (Dennis Haysbert). That slowly spirals out of control as the community begins to discriminate them, especially her husband, who values his whiteness, above his gayness, that being the ultimate prejudice. What Haynes is saying is that the problems of the 21st Century, that is the scale of the discrimination, was already there in the 50s. And as much as they weren't allowed expression then, it hasn't gone away today. This means that Far From Heaven is not only a retro film but a contemporary one as well. Sure the sets, costumes and colours are gorgeous and detailed and bring a heavy sense of nostalgia. But it's also mannered, manufactured and stylised. Notice how clean all the cars are. That sense of artificiality also comes through even in the dialogue, especially in the pseudo-politeness that the children express. The children, like the black man (Dennis Haysbert), are constantly told to stay in the background or to move away. The Julianne Moore character is also in a ghetto of her own, a circle of high society women, who protect their space possessively. Cinematographer Ed Lachman shoots the film in a colour-drenched autumnal hue while Haynes brings out superb nuanced performances from his three leads. Sirk would be honoured with this queer tribute while Rock Hudson would feel vindicated. Note: The film opens in Singapore June 19. Ten lucky winners will each walk away with a pair of tickets to Far From Heaven, which opens June 19. Just name any one of the four Oscar nominations that Far From Heaven got this year and email your answer to singbigo@singnet. com.sg. Prizes courtesy of Golden Village Pictures. Closing date: June 17, 2003.